Curious little ones love to explore everything around them, and as such, an essential part of childproofing your home is finding the right lock for your cupboards and drawers. There are myriad ways to childproof your entire home, but locking the lower cupboards and drawers is the best place to start. The key to a good lock is finding something that is easy for adults to release quickly but too difficult for children to figure out. We’ve got our top suggestions for locks that do just that, plus a brief review of what earned them a spot on our list. There are several different lock types for cabinets and drawers, specifically in the kitchen and bathroom. Each type has its own benefits and drawbacks, which we’ll break down below. Magnetic locks: One of the best things about magnetic locks is that they don’t allow the drawer or door to open at all, so there is no gap for little fingers to get stuck in if your kids try to get into things. The lock must be precisely installed, which can be tricky, but adhesive strips (rather than screws that require drilling) make installation easier. Many people also prefer magnetic locks because all of the parts are hidden so the result is more aesthetically pleasing. Traditional latch locks: The more traditional lock features a latch and corresponding catch installed inside the drawer. When a drawer is pulled out, it creates a small gap, which allows you to push down on the latch to release it. Children can get their hands stuck in this situation, but it means you can more easily open the drawers yourself without keeping track of a key. 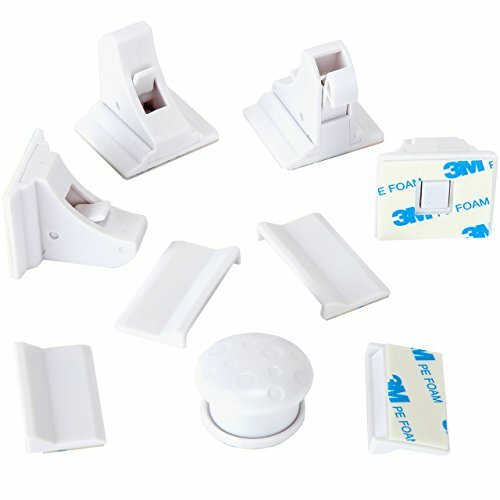 Adhesive strap locks: The straps are flexible so they easily wrap around the door of a refrigerator, microwave, or other object that you want to keep closed. Many have a dual-release button to make it harder for children to open, and the ends attach with strong adhesive. Locks for handles and knobs: These locks are specifically for cabinets and cupboards, and they work by looping a cord around the handles of a pair of cupboard doors. The handles must be a few inches apart, but this is the easiest to remove and replace. 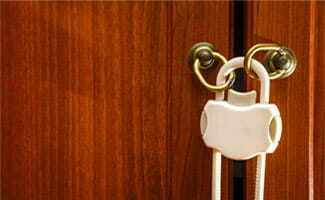 The Safety Baby Magnetic Cabinet Lock is our top pick for magnetic locks. The lock has to be installed precisely, but it uses adhesive strips, making it easier and quicker to do. Plus, if you rent your home and can’t install hardware in your cupboards, adhesive locks are an excellent solution. Some users report that the adhesive weakens with repeated use, but only a fraction of users seem to have this issue. Every part of the lock installs on the inside of your cupboards and drawers with no visible indication it is there, and it unlocks with a magnetic key. This may be slightly less convenient when you work in your kitchen for an extended time, and you will always need to be careful not to lose the key, but the Safety Baby magnetic locks can be disabled so drawers and doors can be opened normally. This feature is perfect for when you’re making dinner or for grandparents who want to keep things locked only when the grandkids come over. Our second choice for magnetic locks, the Safety 1st Magnetic Cabinet Lock, is similar to our top pick with just one main difference: it has to be installed with screws. Some users may prefer this solid attachment over adhesive, but we found that the additional hassle of drilling made the required precise installation much more difficult and time consuming. The lock’s tight fit means that little fingers won’t get pinched if your kids attempt to open a locked door or drawer, and all the hardware is on the inside for a cleaner look. A magnetic key is required to open the lock, making it very secure. Keep in mind you’ll have to keep track of the key, but you can disengage the lock when needed. The Safety 1st lock is also a bit less expensive, so if you don’t mind the extra installation time and energy, this may be a better choice for your family. Our top nonmagnetic lock choice for cabinets and drawers is the KidCo Swivel Cabinet & Drawer Lock. The latch and corresponding catch mount inside the drawer or door using screws (so drilling is required, as well as some exact measuring). When the drawer opens, it creates a large enough gap to let you push down on the latch and release it. This means there’s no key to keep track of and you can open the doors and drawers anytime. Unfortunately, it also means that kids can get their fingers pinched or get small items out of the drawers. We especially liked that the KidCo’s latch can be disabled by swiveling it downward. We loved this feature of the magnetic locks and were pleased to find a nonmagnetic lock that offered the same flexibility. 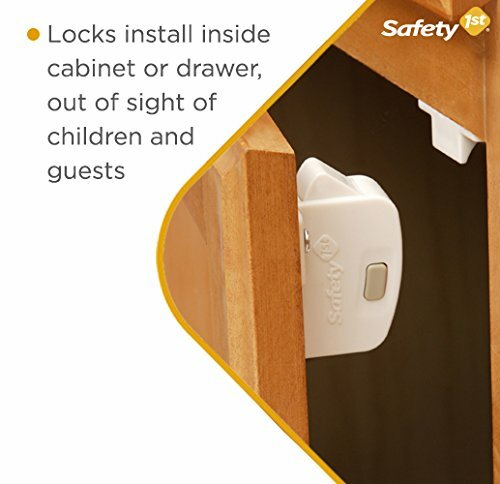 The Good Stuff Child Safety Cabinet Latch resembles a traditional catch-and-latch system with one difference—instead of including both a latch and a piece it catches on, the lock comes in one piece and latches onto the lip of the drawer or cabinet. This means a quick and easy installation, especially since the latch uses adhesive instead of screws. However, this also means that it will not work for all cabinets and drawers, so you’ll need to double-check the style of your cabinets before purchasing. Once it’s installed, you can release the lock by pushing down on the spring-loaded latch, making the lock easier to open than other designs that use keys. We like this design a lot, but please note that it creates a small gap that your children’s fingers can get caught in. Overall, we prefer the magnetic locks, but if that doesn’t fit your needs, this is a good option for keeping little ones out of cabinets and drawers. The Munchkin Xtraguard Multi-Use Latch is our top pick for strap latches because its dual-button release is too tricky for small children to use. We also like the versatile style of this lock. 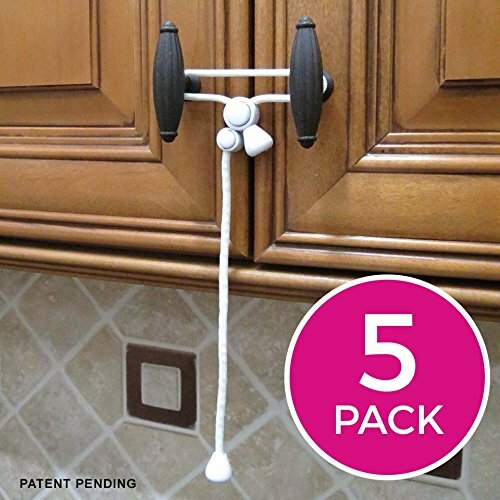 The Xtraguard has a flexible, adjustable strap so it can be used on almost anything—cabinets, drawers, refrigerators, microwaves, toilet lids, etc. It attaches with adhesive, though the number-one complaint we found from users was that the adhesive wasn’t strong enough or didn’t attach securely to some surfaces, notably porcelain toilet bowls and lids. However, this accounted for a very small number of reviews, and most reviews were extremely positive. One downside is that you cannot order a new strap if the original strap breaks or additional adhesive if you need to reposition the latch—you’d have to purchase all new latches. However, the dual-button operation and that extra bit of security make it worth it to us. Our runner-up for adjustable strap latches is the BabyKeeps Child Safety Lock, which employs the same adjustable, flexible straps and easy installation with adhesive as our top pick. It also comes with extra adhesive in case you need to reposition the latch, and it has a five-year limited warranty, which is better than we’ve seen for most other childproof locks. The BabyKeeps latch has many of the same complaints about the adhesive coming off easily. Since it doesn’t have the dual-button release of our top pick, we also found a smattering of reports that small children were able to figure out the release mechanism. For that reason, the BabyKeeps Child Safety Lock fell into second place, but if you need a less expensive option, this would work well. Although slightly more expensive than similar products, the Safety 1st OutSmart Flex Lock is our top choice for a cupboard with handles. Some parents choose this style of external lock that loops over the outside handles because it is so easy to remove and replace and it avoids the hassle of installation and drilling. The Safety 1st OutSmart Flex Lock has two adjustable loops that fit around cupboard handles and tighten securely so children can’t open the doors. Most locks of this style work for either knobs or long handles but not both. The OutSmart Flex Lock is an exception, earning it the top spot on our list. It also fits handles that are spaced three to eight inches apart, which is a wider range than many similar options. 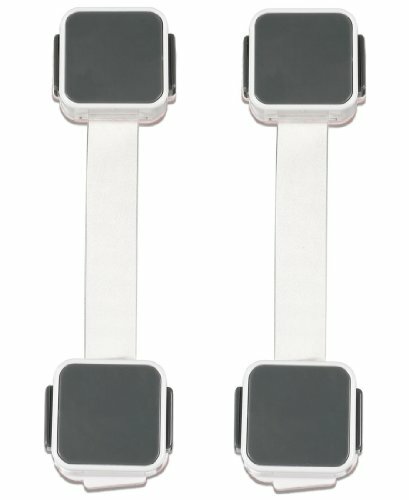 The OutSmart Flex Lock uses a dual-button release that is not obvious to the casual (or young) observer. Instead, a decoy button on the front distracts small children looking to take the lock off. 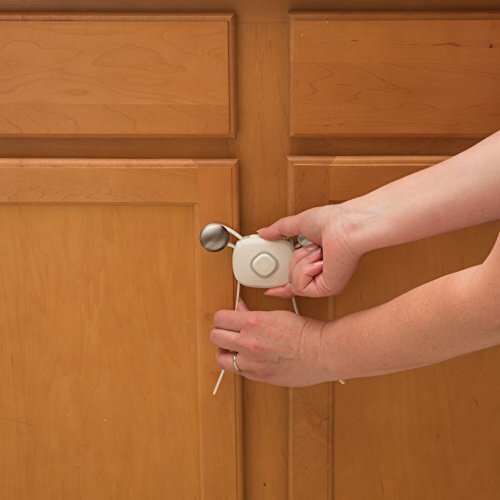 The Kiscords Baby Safety Cabinet Lock is our runner-up pick for cabinets with knobs, and it comes highly recommended by users. You loop a cord around the two knobs and tighten it with a small, easy-to-adjust lock. It’s too tricky for small children to open but easy for adults to release with one hand. 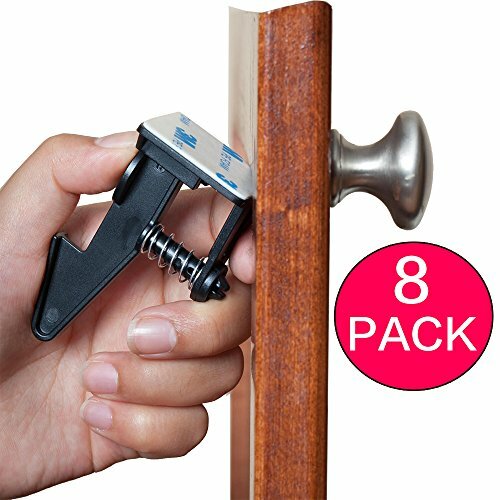 This lock doesn’t require any drilling or adhesive, making it incredibly simple to install. However, because it sits on the outside of the cupboards, it isn’t as aesthetically pleasing as something installed on the inside. The Kiscords lock fits over knobs spaced up to 6.5 inches apart. It won’t work for anything farther apart or on cupboards with closed loop handles, so be sure to measure what you have before purchasing this lock. Once babies become mobile, you can take plenty of steps to make your home safer for them, from using baby gates and door handle covers to installing locks on cabinets and drawers. The best lock for your family depends on the type of cupboards and drawers you have, how frequently you expect to use the locks, and of course, your personal preference for how things look and operate. Be sure to measure your cabinets and consider your options here, then enjoy the sense of safety that comes from knowing your home is childproof. 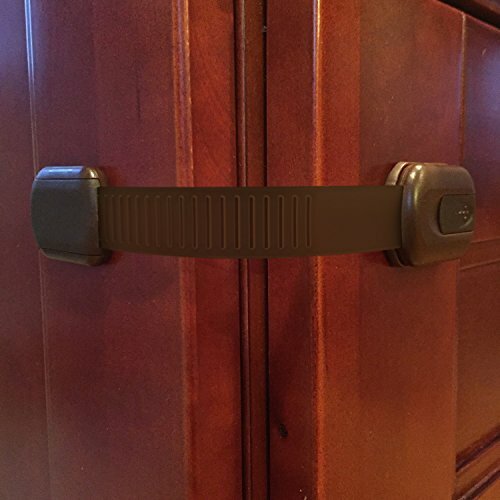 What kind of lock do you use to childproof your drawers and cupboards? Do you have a favorite that we missed? Let us know in the comments below!